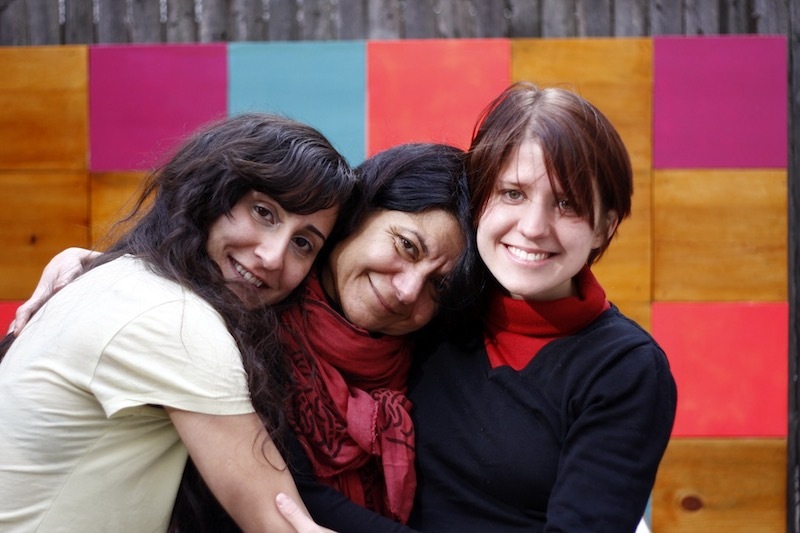 Please click the links to find biographies for: Aida, Zohreh and Nahid. Back in 2010, when I had just made a transition from living in Ireland to renting an apartment in Manhattan, I attended a concert held at a cafe/art gallery called Zora space in Park Slope, Brooklyn. I was invited by my friend Jake Clemons, who was performing as one of the acts, and I accepted his invitation with a fair amount of excitement, having made a conscious decision at the time to embrace the more social life of New York City in comparison to my “out in the country” life in Ireland. I took the F train to Smith and 9th street and walked to the cafe a few blocks away. At the door, I was greeted by a most lovely presence. A woman who, though busy talking on the phone, gestured for me to come in. I entered, pleasantly surprised at the beauty of this space, having expected a bar or something of the kind. All the more was I taken by this petite lady, who hung up the phone and introduced herself to me as Zora. She thanked me for coming in, and looked at me with these beautiful dark eyes, that made me feel as if I was meeting an old friend. Perhaps a faint memory from another lifetime darted across my mind, or perhaps I caught a glimpse of the future. One way or another, Zora was to become a lifelong friend and mentor to me. It was a beautiful night of lovely music and people, tea-drinking and admiring the art that hung on the walls of this small candlelit space which made one feel warm and cozy. It was on this night, that I was introduced to Aida Shahghasemi, a young woman and a kindred spirit in whom I found a sister and a musical companion. We were introduced to one another by our host, Zora, who felt we should meet, as we were both musicians who could and did make a connection. While viewing the art exhibited in a section of this space, I was struck by their uniqueness and stunning beauty. They were accredited to an artists named Nahid Hagigat, a Brooklyn based woman from Iran. They appealed to me for their strong images of vibrant colors set against a gold leaf background, sealed with a golden dust that sparkled upon the contact with rays of light that fell upon them. There was one in particular though, that caught my attention, as it portrayed a pomegranate which was at the time something of a symbol for me that kept reappearing at every step of the way, as if to reassure and reaffirm, that all was well and I was on the right path. I inquired about purchasing this piece and at the end of the night, ended up bringing it home with me to my Bleecker street apartment. I hung it up by my bed and kept marveling at it’s beauty day and night, until finally it occurred to me that I was looking at what was meant to be the cover of a record I was preparing at the time ( ANAR ). I contacted Nahid and we agreed to meet at Zora space, where I got to ask her permission and she kindly consented. This was also a beginning of another friendship and collaboration. I would meet Nahid on regular basis and converse with her over persian tea and biscuits. During one such visit, I brought forward an idea of commissioning her to paint two more pieces for the trilogy of records I knew then I would create over the course of the coming years. One of them you know as the bird on the cover of MUNA, the other one is yet to be revealed in due time. I am honored to know this woman and artist and to have her work be the visual representation of my music. And so it is that I met this trinity of spectacular women, Zohreh Shayesteh ( Zora ), Aida Shahghasemi and Nahid Hagigat, who served as my anchor and support system during my time in New York. I ended up moving in with Zohreh and her husband Nersi, who welcomed me into their family as a daughter and my time with these lovely people was somewhat of a golden period in my life, filled with kinship, magic, delicious food and laughter. I wrote all the songs that now form MUNA in this peaceful but lively sanctuary.